Considering the size of the city, Karlsruhe (the place where I live) offers some nice events every now and then. The jazz club does its best and sometimes great artists stop by - recently Bill Frisell’s Big Sur Sextet was here. The band was absolutely great but the audience was strange. A couple sitting next to me complained that the music was lengthy and boring (they left after the break), a group behind me acknowledged the musicianship but thought that they could let it rock more often. Well – what did they expect? It’s a string quartet plus guitar and drums (!) and no matter what these people said they had some great music in their luggage. 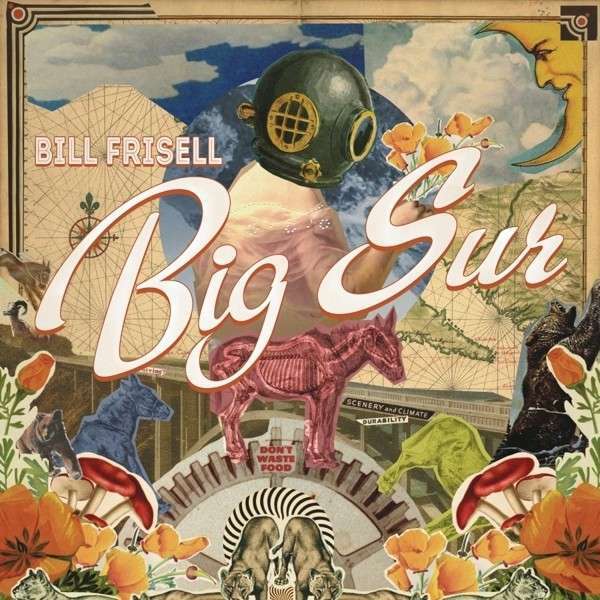 “Big Sur”, the album they played that night, is a collection of songs Frisell composed in ten days on the remote Glen Deven Ranch as a commission for the Monterey Jazz Festival, that premiered during the festival last September. He described the compositional process as “old-fashioned”, the music is inspired by the green valleys and the unspoilt nature, the pristine beauty of the landscape. You can find folk songs and dances (“Hawks”, “A Good Spot”), Rock’n’Roll stomps (“The Big One”), weird ballads (“Somewhere”), spooky ditties (“Big Sur”), melancholic tunes (“Cry Alone”) and characteristic Frisell-like Americana (“Far Away”). All the songs are prime examples of subtleness, fragility and tight tenderness, the typical Frisell elements – the tremolos, the vibrato, the trills, the twangs, the elegant lines, the light and airy tunes, the open chords – exude the atmosphere of earthbound blues, bluegrass vitality, and the joy and hardships of rural life. In general, the sextet sounds like a very sophisticated country orchestra, as if they were playing in an elegant Western saloon. Apparently, “Big Sur” stands in the tradition of the outstanding “Good Dog, Happy Man”, of “Nashville”, “Ghost Town”, “The Willies” or “Disfarmer”, albums on which Frisell has already explored the structures of American folk music. But what is new here is the compositional rigor, how he gives the melodic arcs the ability to breathe, the cross references in the structure. Everything is in the right place. For this album Frisell has chosen both long time companions like Hank Roberts (cello), Eyvind Kang (viola) and Jenny Scheinman (violin) and new collaborators like Carrie Rodriguez (violin) and Rudy Royston (drums). Royston especially employs interesting contrasts that sound rather like another string instrument than a percussive one, he seems to be more interested in adding acoustic colors instead of obvious rhythmic elements (of course he is able to do that as well). Live, the songs were expanded greatly as the band integrated them into a larger picture, which was even more interesting than the short forms on the album. It was a hot summer evening and you could see flies buzzing in the stage light (the location was half-open), the perfect atmosphere for this music. Frisell had a constant smile on his face, he was very satisfied with everything. So was I. A man who names a song “We all love Neil Young” can’t be wrong.